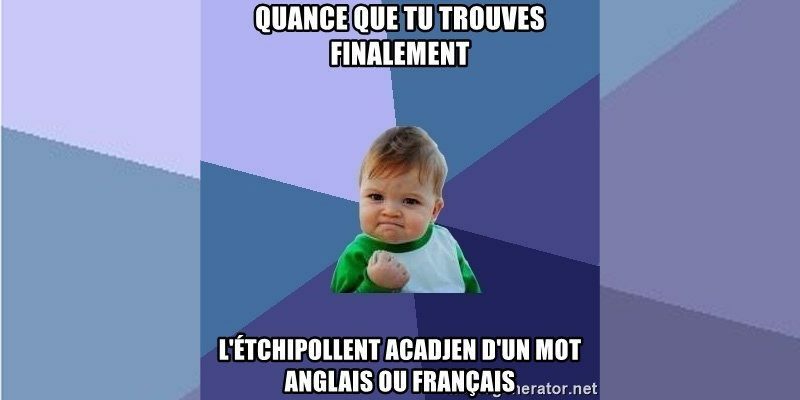 In 2018, Acadian French is one of the languages taking part in the Mother Language Meme Challenge, with memes created by our partner @LangueAcadienne, an Acadian French advocate based in New Brunswick, Canada. As its names suggests, Acadian French derives from French through the colonization of the north-eastern coast of the American continent by French settlers in the 17th and 18th centuries. Acadia was the name of one of France former colonies in North America, along with Canada and Lousiana (although they had very different borders than the ones we know today). In modern terms, Acadia would most closely correspond to the Canadian provinces of Nova Scotia, New Brunswick and Prince Edward Island. There also exists an Acadian diaspora, mostly due to the Acadian Expulsion of 1755-1763 and more modern economic migrations. In an interview with Rising Voices, the primary user, who prefers to remain unnamed, behind the @LangueAcadienne account shares a little more about his language and his participation in the #MemeML Challenge. Rising Voices: What is the current state of your language both offline and on the internet?